They say when it’s right you know it. That’s exactly the case for Carly and Geoff Reisner who purchased a Clover ranch at The Reserve in St. Charles from Meritus Homes. 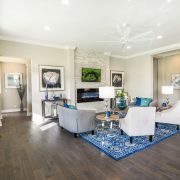 What began as a casual search for a single-family home turned into a quick decision to purchase the moment they toured the Clover model. Living in a townhome in Elgin, the couple was just starting their home search in late 2017. 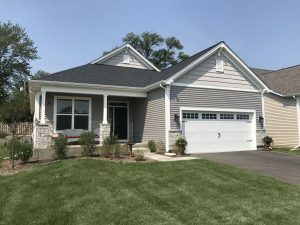 After touring about a half dozen new homes along with several resales, they learned about the new ranch model Meritus Homes was debuting at The Reserve in St. Charles. The Reisners closed on their new Meritus home in September of 2018 and have been thrilled with their decision from day one. At The Reserve in St. Charles, Meritus Homes is offering five floor plans for the community’s semicustom homes. The Clover is one of two ranches. Three two-story designs also are available. Overall, homes have 2,491 to 3,716 square feet of living space, three or four bedrooms, two to 3-1/2 baths, and two- or three-car garages for base prices that range from $519,900 to $569,900. The Clover is an elegant ranch with an open-concept layout. The center of attention is the everyday living space, which features the designer kitchen with center island flowing into the adjoining dining room and spacious living room. A covered porch in back is ideal for outdoor dining or simply relaxing. The master suite has a walk-in closet and private luxury bath. A second bedroom also has its own bath and walk-in closet while the third bedroom can be converted into a den. In addition to the full basement, extra storage space is abundant in the garage. Carly noted that the couple did make some upgrades like adding a tray ceiling in the master bedroom and an octagonal tray ceiling in the foyer—which creates drama. They also added a bay window in the dining area and upgraded to a deep pour basement from the standard basement. They added a sliding door between the master bath closet and the neighboring laundry room to make doing laundry extremely convenient. The couple turned the third bedroom into an office, as well. “We really enjoyed working with Meritus Homes because of their flexibility,” said Carly. “We were able to make semicustom changes. Coming from a townhome, the Reisners had never purchased new construction before. Carly believes that working with a mid-size locally based builder over a big box economy builder was a huge advantage. While the Reisners built their home from the ground up, Meritus Homes has two homes ready for quick move-in at the Reserve in St. Charles: the two-story Marquis priced at $624,900 and the Clover ranch priced at $627,500. Nearly six months after moving in, the Reisners are thankful every day for their decision. Because of the large homesites that provide big back yards and its location in highly rated School District #303, The Reserve in St Charles is home to many families with young children. However, the neighborhood also has retired couples who have been attracted to the ranch homes. Carly described the mix of residents as a very social group…inviting, warm and kind. The Reisners already have seen homeowners out walking their dogs on the community’s trails and expect more outdoor activity as children play in the neighborhood park once the weather warms up. To visit The Reserve in St. Charles, take Rt. 31 and turn west onto Reserve Drive, which is between Red Gate Road and Silver Glen Road. Proceed to the sales office at 775 Reserve Drive. A decorated model is open to tour from 10 a.m. to 5 p.m. Monday through Saturday and from 11 a.m. to 5 p.m. Sunday. On Saturday, March 2, Meritus Homes is hosting an open house event. Home shoppers are invited to visit the property, tour the quick move-in homes, and enjoy pizza and refreshments from Riverside Pizza & Pub. Two quick move-in homes are available to walk through and are ideal for anyone who has already sold their current house and is on a short timeline to relocate. For more information, call (224) 634-4054 or visit www.MeritusHomebuilders.com. 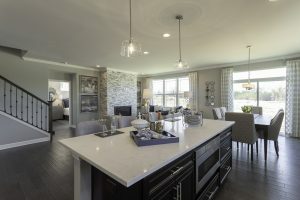 An open-concept layout is one of the design features attracting new-home buyers to the ranch homes at The Reserve in St. Charles. 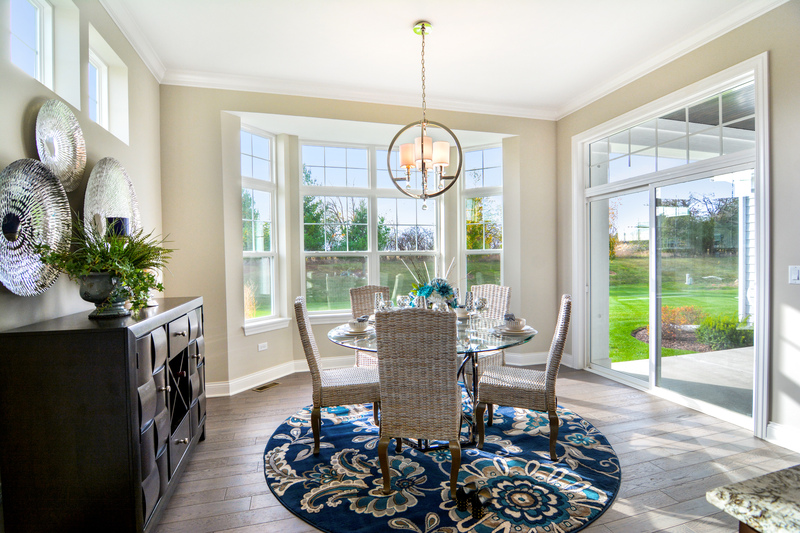 Meritus Homes pays special attention to the details, like creating a bright and airy dining area in the Clover ranch. Just the right fit. That’s how Angela Nassopoulos describes her brand-new ranch at The Enclave at Mill Creek. She and her husband Ari moved to the west suburban community last summer after searching for a single-level home to suit their empty-nester lifestyle. Developed by Meritus Homes, The Enclave at Mill Creek features detached, single-family homes in a low-maintenance setting. Only a handful of the 44 homes in Phase I remain for sale, including four that are built and ready for move-in within 30 to 60 days. When they moved in last June, Ari and Angela Nassopoulos became one of the first residents at The Enclave at Mill Creek—purchasing before models even opened. The couple heard about the property when researching online, then stopped by the sales center. They reviewed the blueprints and were sold. The couple purchased the Primrose, which has 1,946 square feet of living space, three bedrooms and two full baths. It offers a variety of today’s most sought-after design features such as a luxury master suite with a private bath and oversize walk-in closet, a big family room that flows into the dining area, a laundry room conveniently located off the two-car garage, a walk-in pantry in the kitchen, and Angela’s favorite—a 10-foot-long center island that ties the kitchen to the dining area. The couple converted one of the three bedrooms into an office, added a fireplace and upgraded appliances and flooring. They made a few tweaks to some closets, as well. The Primrose at The Enclave at Mill Creek is the fourth home that Angela and Ari Nassopoulos have built. As someone who has gone through the new construction process before, they were very pleased with Meritus Homes. Meritus Homes is offering five designs at The Enclave at Mill Creek. Ranch plans have 1,379 to 2,154 square feet of living space; two, three or four bedrooms; and two full baths for base prices that range from $370,900 to $427,900. Second-story options add 866 to 1,090 more square feet of living space, one or two bedrooms or a loft, and another bath on the upper level. This brings the square footage up to 2,620 to 3,077 with base prices that range from $449,900 to $471,900. 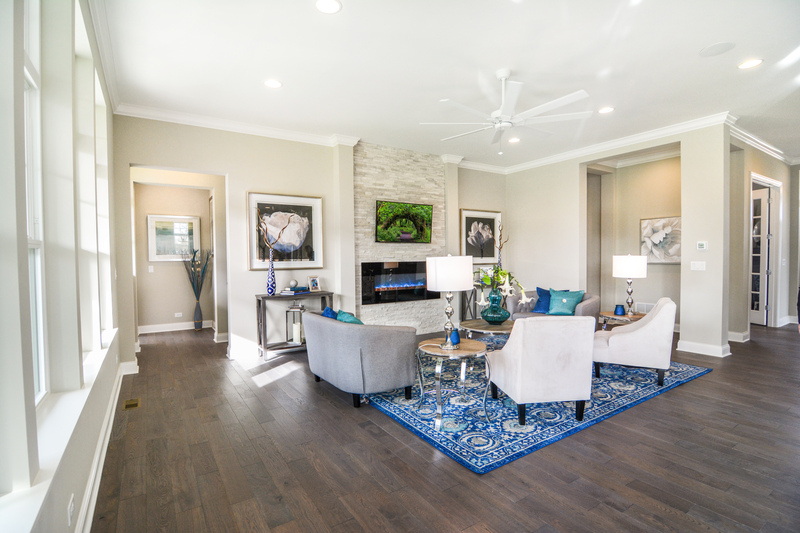 All homes at The Enclave at Mill Creek are built to the exacting standards that signify a Meritus home. Interiors have nine-foot first-floor ceilings, Colonist doors, decorative touches such as rounded drywall corners and brushed nickel finishes, central air conditioning, and full basements all as standard features. Bath floors and shower walls have ceramic tile as standard and vanity tops are cultured marble. Master baths have the added luxury of separate showers; custom-finished, wood, raised vanities; large linen closets; and compartmentalized water closets. Meritus homes showcase energy-efficient construction for greater comfort and energy savings than older houses. This includes Tyvek® house wrap, ice and water shield protection for the roof, a damp-proofed foundation, 40-gallon high-efficiency water heater, R-21 wall and R-49 ceiling insulation, and 2-by-6 exterior wall construction. Outside, homes at The Enclave at Mill Creek have classic elements such as brick and stone accents, and some have covered entries or front porches to provide shelter from inclement weather. Exteriors are constructed of low-maintenance materials such as vinyl siding for easy upkeep. Front, side and rear yards are fully sodded plus a landscaping package is included with each new home to give it instant curb appeal. The homeowners’ association handles snow removal and performs all common area landscape maintenance as well as lawn care for each individual homesite, creating a low-maintenance environment ideal for anyone looking to reduce the amount of time they spend on outdoor chores. The Enclave at Mill Creek also has abundant green space…including Westwood Creek, three ponds and a scenic sitting area…with more than one third of the ranch-style homes backing to natural areas. Plus, it is tucked in an established area in central DuPage County. Positioned at the intersection of Army Trail Boulevard and North Mill Street, the neighborhood is within minutes of Interstates 355 and 290 as well as Ill. Hwy. 83/Kingery Highway for easy access to Chicagoland’s western suburbs. The community also is near stores, entertainment, movie theaters, golf, casual dining, forest preserves, and everyday conveniences. On Saturday, February 9, Meritus Homes is hosting an open house. Home shoppers are invited to visit the property, tour the quick move-in homes, and enjoy pizza and refreshments from the Giordano’s Pizzeria on Lake Street in Addison. Three quick move-in homes are available to walk through and are ideal for anyone who has already sold their current house and is on a short timeline to relocate. 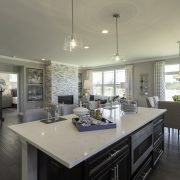 For more information on The Enclave at Mill Creek, (224) 634-4034 or visit www.MeritusHomebuilders.com.